Did the Wayback Machine Catch Russian-Backed Rebels Claiming Responsibility for Malaysian Airlines Flight MH17? 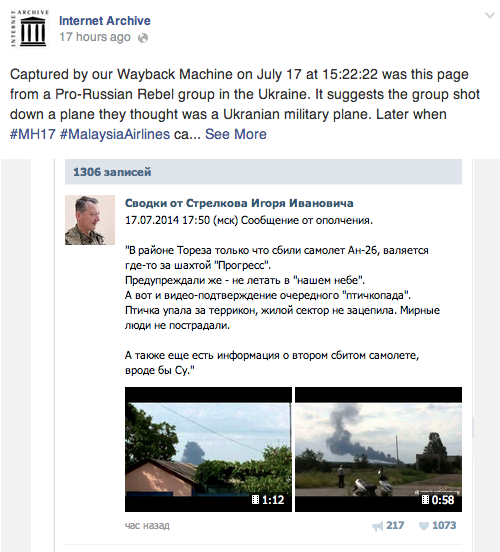 | Open Culture Did the Wayback Machine Catch Russian-Backed Rebels Claiming Responsibility for Malaysian Airlines Flight MH17? Did the Wayback Machine Catch Russian-Backed Rebels Claiming Responsibility for Malaysian Airlines Flight MH17? If you're a long-time reader of Open Culture, you know all about Archive.org -- a non-profit that houses all kinds of fascinating texts, audio, moving images, and software. And don't forget archived web pages. Since 1996, Archive's "Wayback Machine" has been taking snapshots of websites, producing a historical record of this still fairly new thing called "the web." Right now, the Wayback Machine holds 417 billion snapshots of web sites, including one page showing that "Igor Girkin, a Ukrainian separatist leader also known as Strelkov, claimed responsibility on a popular Russian social-networking site for the downing of what he thought was a Ukrainian military transport plane shortly before reports that Malaysian Airlines Flight MH17 had crashed near the rebel held Ukrainian city of Donetsk." (This quote comes from The Christian Science Monitor, which has more on the story.) Girkin's post was captured by the Wayback Machine at 15:22:22 on July 17. By 16:56, Girkin's post was taken offline -- but not before Archive.org had its copy. To keep tabs on this story, follow Archive's Twitter and Facebook pages. Could someone kindly provide a translation? It’s the fake account on “Vkontakte”.